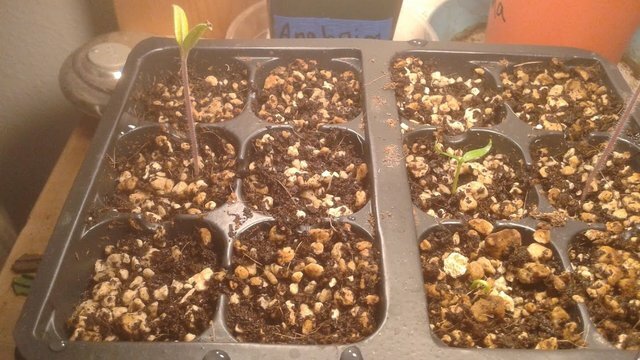 Indoor Gardening: Seedling updates for mid-February [Gardening]steemCreated with Sketch. 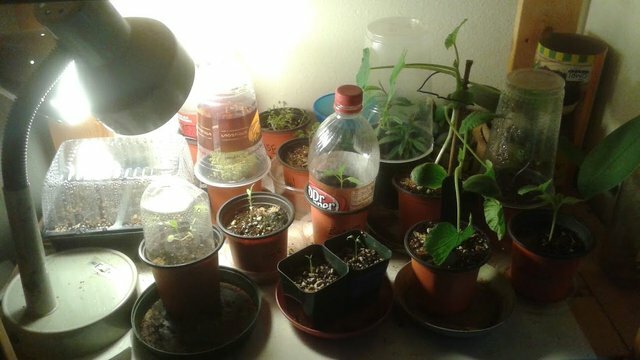 Check out the various indoor seedlings I have been developing. All of these little guys are forming new leaves, roots, and stronger stems to they will be ready to join the garden outside this coming Spring. 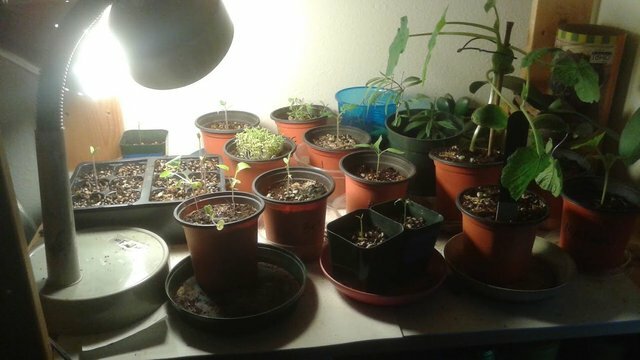 This is my third or fourth year growing from seeds, and I get better and learn more about plant health every year I try it. Watching them grow also supports my emotional health in a funny way. I guess it motivates me, showing my achievements I can be proud of, and also fills me with something I can reliably hope for, for a greener bounty in my visible future. Every year I try growing a few of my favorites, and I also try a few new things. Some things don't grow well in my climate, and I invent new ways to alter the growing conditions or micro-climate to better ensure the plant's health when I try again. 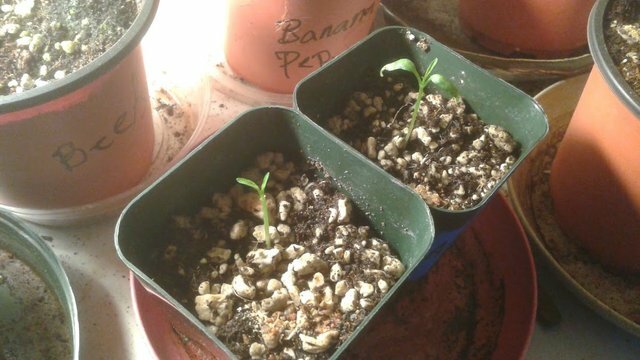 In this article I'll be sharing an update on the stages of the various plants I have been growing. You'll also see how many days each one has been growing since germination, as I have been tracking that from the start on my plant map. Starting with my seedling tray, this is my second set of seedlings using this little tray this year, and boy is it a super productive little too! Not much has germinated yet. Amazingly, the peppers have sprouted before most of the tomatoes. None of the lettuce sprouted. Very odd. Maybe I should have pre-soaked this round of seeds like I did with everything else. Another experiment. Lesson learned. This is my plant map, as I call it. The first date is the day the seed was sown. The second date is when I notice it has sprouted. This map is NOT aligned properly to the photo above. Do a 180 degree flip around, and you'll see Money Maker is the #tomato shown most clearly on the left side. I didn't want to flip the map around, because it would through the text upside-down. Center, is Ancho Poblano #pepper. Recently sprouted. Center Right, is Roma #tomato. Looking super strong. Lower Right, is Delicious Beefsteak #tomato. These seedlings always seem to grow slower for me than other tomatoes, but once they toughen up in Summer, they speed up. I'm not sure I have a warm enough climate and nutritious enough soil to grow these from seed, because they have never produced finished fruit for me to enjoy. Here is another Ancho Poblano #pepper. Not sure what it's doing with it's head in the sand, but it's been like that since the start. I'm going to leave it alone because it is green and absorbing some lamp light, and it probably has a fragile root. No signs of rot or mold. I could care less if it has a twisty stem, as long as it's healthy, I'll grow it. #Nicotania, barely visible in the center above is my flowering #tobacco plant. It is a white flower variety known as Starlight Dancer. The light reflection on the wet leaves make it look like it is glowing, but I assure you it is really yellow-green. Nearby, I have two more nicotania seeds sown, but they have not germinated. They are very slow to germinate, up to a month. Young tobacco plants grow circular leaves that sprout from the top of the stem in first one set of two leaves, and then a larger set of two more circular leaves, making it resemble a four-leaf clover. Tobacco seeds are some of the smallest of all my seeds, smaller than a grain of sand. 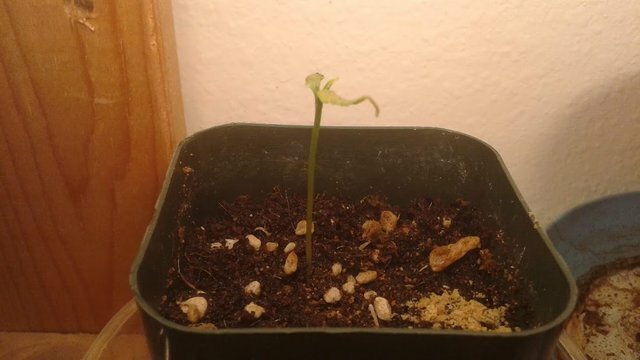 The seedling will stay very small like this for many weeks. In the summer, it will explode in growth, and produce season-long sweet flowers, and thousands of collectible seeds. That's about it for my seedling tray. I'm still waiting for these tiny seedlings to develop their first true leaves before I consider transplanting them into small pots. Right now they are all too fragile to handle. Nearby, I planted #turnips. 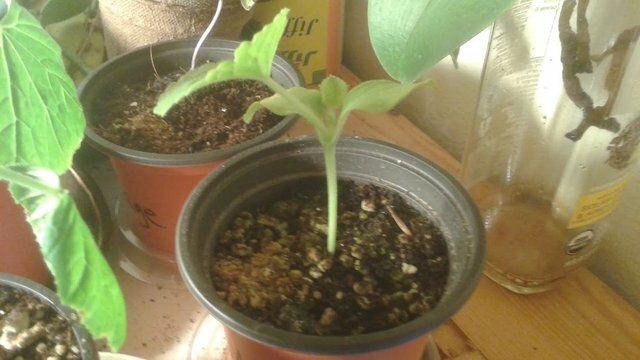 These three seeds all sprouted successfully around the same time. I did not grow these in the seedling tray first, they were direct sown into the pot. Turnip does not like to have its young taproot disturbed by transplanting. Also, I can't ever really get the stems to stand upright. They always bend over and wiggle around like worms, not like I imagined their shape should be. These turnips were sown on January 13. That makes these 31 days old since they were sown. Last year, I discovered these make a delicious garden treat for the slugs. I had plants about this size that were direct sown outside. They kept sprouting new leaves, and the slugs kept licking them up. The ones the slugs couldn't finish, the squirrels dug up. This year my action plan is to get them to a larger size and transplant them into the garden. If it has a strong root, then it will be okay to let the slugs eat the weakest leaves. I can also use some screen material over the roots to prevent squirrels from digging it out. Above, another Delicious Beefsteak #tomato. This was grown in my first round using the seedling tray, and carefully transplanted into this pot once it had some true leaves forming. I planted the seed on January 17. Now it is 26 days old. Note, one of the baby leaves broke off when I lifted this one up during the transplanting process. Fortunately it did not harm the stem or the leaf bud, because the new leaf is growing strong. Tomatoes respond really well to leaf pruning, and are quick to regrow new leaves to replace the tired old ones. 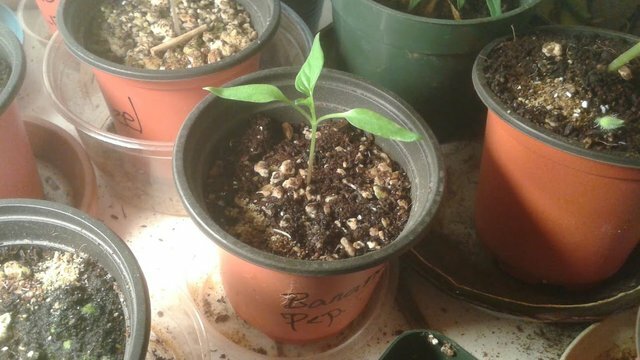 Banana #Pepper is one of the easiest peppers to grow. They always seem to start out with a lot of vigor. I planted this seed in the seedling tray on January 11, and then transplanted it into this pot a few weeks ago. Now it is 32 days old. 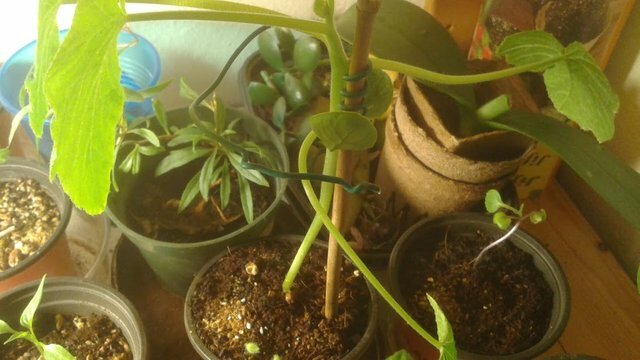 Pepper stems are very flexible and it will stretch every day towards the light. I have to rotate the pot every couple days to keep the leaves growing straight up. Too much lean, and the stem might will flop down towards the damp dirt, where it might collect mold or rot. This is a pair of Anaheim #peppers, direct down into these small pots. I think they will do fine in these pots for a while, because they seem to be slow growers. Guess I lost track of when I planted these seeds. They look a long time to sprout. I am guessing they are about 26 days old since they were first sown. This is a new seed for a plant I have never grown before. Planters Jumbo is a #melon. 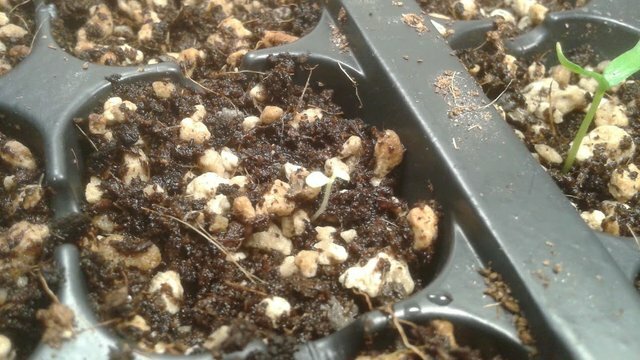 I started this seed under the dome inside the seedling tray on January 6. Had nearly given up on it, until it sprouted on January 23. Since the day it was sown, it's now 37 days old. The almond shaped seeds of the melon have a strong seed shell, that feels almost like plastic. It takes a long time for water to penetrate into the seed. 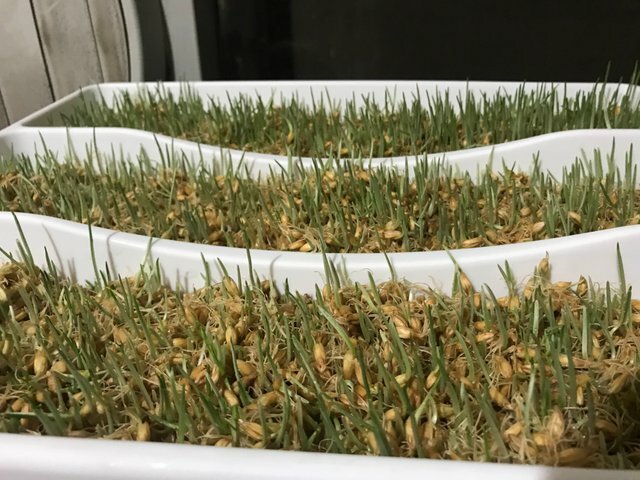 Letting the seed sit in water for longer than 24 hours might help it to germinate faster. Copenhagen #cabbage is another delicious sweet treat for the slug, as I learned last year. Even though the seed packet says to direct sow these babies, you can't really do that in Oregon. 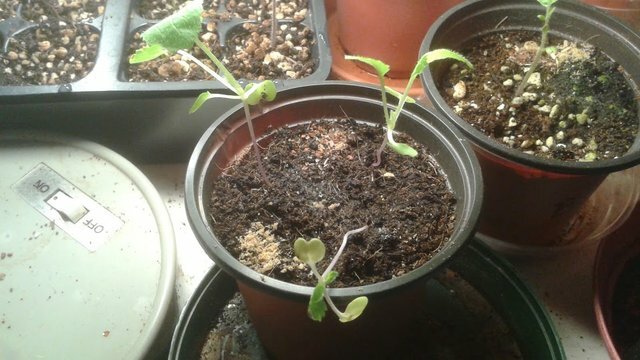 I found out later on that cabbage actually transplants well, and it can be started indoors many months before the outdoor growing season begins. I'm glad I started early. This one was started January 6 inside in the seedling tray, and it survived being transplanted into this pot. That makes it 37 days old. Cabbage sprouts very quickly. It germinated 5 days after it was sown, however it seems to be a slower grower when it is young. I'll have to start growing some more of these soon if I hope to grow a small cabbage patch! 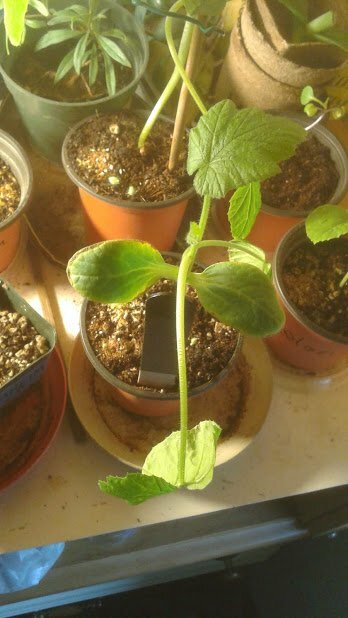 The small sugar #pumpkin is towering over all my other seedlings like a palm tree. Using bamboo and some wire, I staked it up to prevent the flimsy stem from bending into a deep angle. From experience, I've learn that tender pumpkin stems snap very easily, and once they snap, that whole sucker is a goner. Many people have testified to growing pumpkin on a skyward reaching trellis, because these vines love growing upward to chase the sunlight. Only problem with that is how to support the heavy fruit once it gains weight. 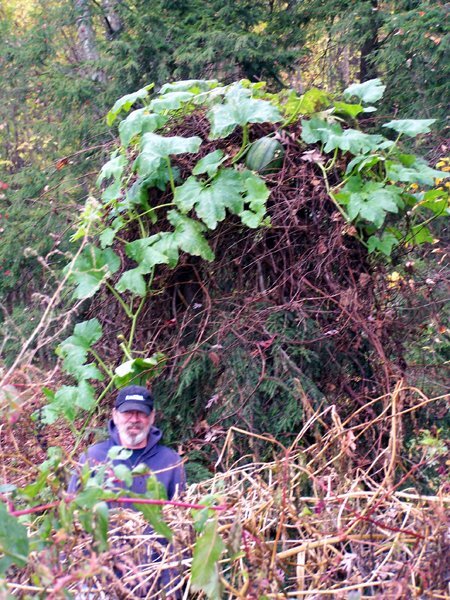 A loose trellis could tip over if not probably secured to bear the weight of the mature pumpkin vine and fruit. Every few days, I find little flower buds forming. Although they are beautiful and sweet smelling, they only last a day in full bloom, and they are a waste to the plant's energy. 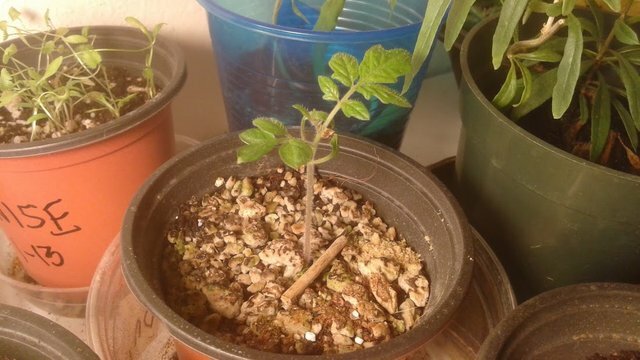 I twist off the young buds to help the plant form stronger roots, stem, and leaves. If I ever find a female flower forming (it will have a tiny pumpkin bulb under the flower bud), then I'll allow the buds to remain, and work on pollinating it by hand. 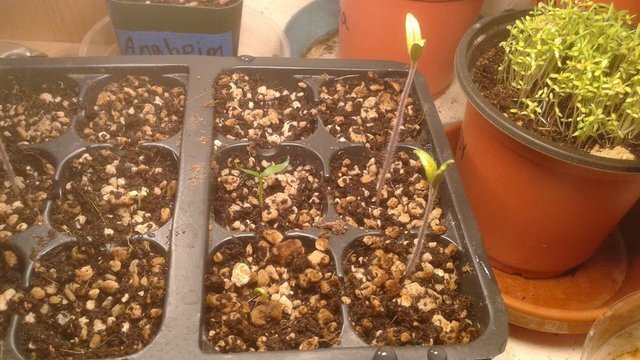 Starting in the seedling tray on January 6, it sprouted on January 14, and quickly outgrew the space. I transplanted it on January 17 into this pot. In total, from the day it was sown, this pumpkin is 37 days old. Beside it, have another #pumpkin of the same variety growing. I planted the seed for this one a bit later, on January 13, and it sprouted on January 17. That makes it 30 days old now. Why do I measure the plant age from the day it was sown? I guess I'm Pro-Life in the plant world. As soon as the embryo is sparked into life by the swelling induced by the absorption of water, I would argue the root starts to grow, forming the beginnings of a living plant. 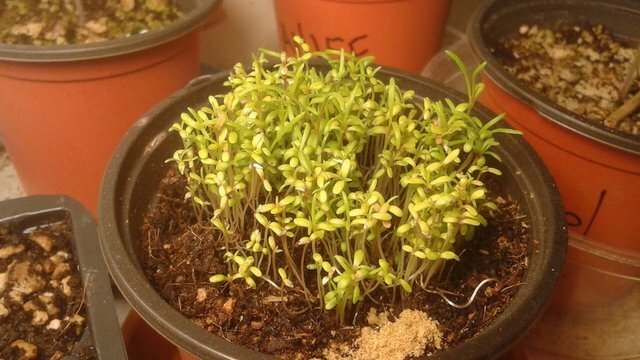 Although technically, one could argue that the plant seeds are actually alive, containing the fully required set of DNA instructions the plant needs. The embryo inside the seed has the beginnings of a root and seed all wrapped up neatly inside. However, seeds can be kept dormant for many years, which means that the life is kept in stasis. Without growth, it is hard to argue anything inside the seed has life or has aged (although with age it can grow weaker and die due to oxidation, mildew, and drying out). Okay, okay! End of the open philosophy thoughts. Back to the plant tour. Here we have the most mature looking #tomato in the bunch. This is a Rapunzel Cherry tomato. Known for being a fast grower, and provider of plentiful never-ending handfuls of delicious fruits. They call her Rapunzel because her hair (vines) keep growing longer and longer, and you can cut as much as you want, but it will keep growing all season long, and probably take over and tangle up the space of other nearby plants. Rapunzel was sown on January 10. It sprouted on January 15. Later on I transplanted it into this pot, where she adjusted quickly and showing renewed vigor. Now she is 33 days old. These are the Swan River #daisies, which is supposed to be a mix of purple and white painted flowers. Obviously these fragile stems would never transplant well. Each stem forms a single taproot that gives life to the young shoot. The young little stems help to support each other when dozens of seeds are planted tightly together like this. It also increases the humidity, providing the moisture the tender young leaves need. They also benefit well from increased humidity by using a plastic dome. 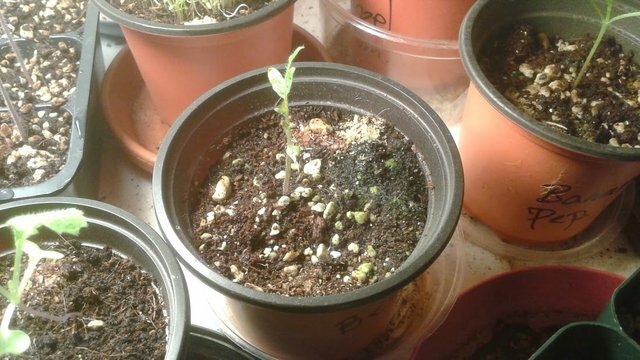 The seeds were planted on January 13. They sprouted within a week, as I recall. Now they are 30 days old. #Anise if my favorite herb. Above I have nearly a dozen of these licorice leaf flavored herbs growing. The seeds are also deliciously licorice flavored to eat, and often ground up and added to cookies, quick-breads, and cakes. Sorry, but you'll have to purchase seeds from an online retailer if you want seeds that are viable to grow. Once the herb grows seeds of its own, you can save the seeds and grow them again for next year. 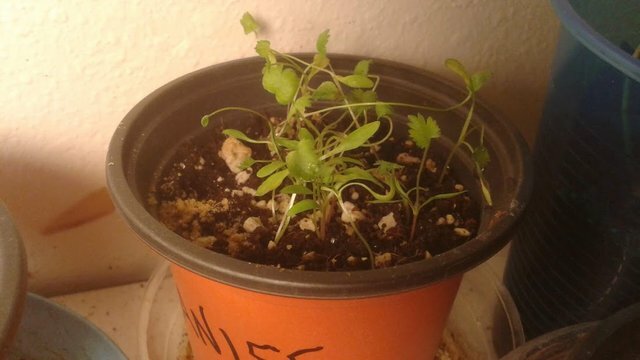 They look almost identical to young cilantro plants, and they have the same growth needs. They do not like to be watered frequently, have soggy soil or wet feet, but the soil must be kept moistened. Keeping a plastic dome or cup over the seedlings also helps the plant and soil to retain moisture. Anise does not like to be transplanted at all, and tend to tip over very easily because the young root and stems are very weak. Growing them in groups helps the stems stay upright and find the light. I'm growing it in a very rocky pumice soil, because pumice holds oxygen, warmth, and humidity, but also drains well. I'm also hoping it forces the roots to split and spread out through the entire volume of the soil, which will make for a stronger spread out root-ball if I decide to transplant this container into the garden, probably in early Summer. These plants do not like cold air at all, but they do best in cool partial shade during a summer heatwave. What's this? More? Yes, I'm keeping track of everything! 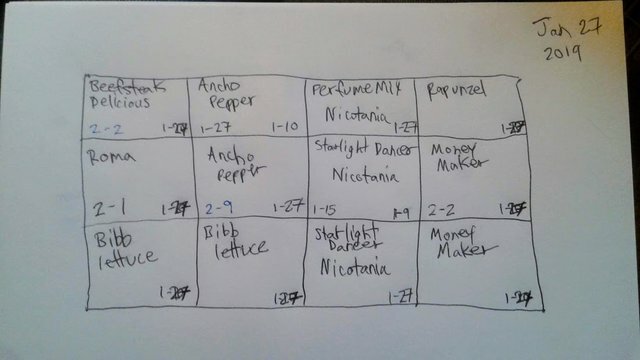 This will help me to plan out my seed starting schedule as I go to look back at my progress. 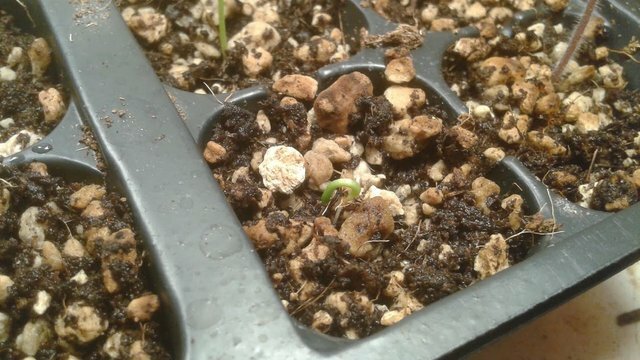 Looking back at my seedling posts from last year has already boosted my success rate considerably! I've only had about two seeds fail so far this year. Above is pictured a young Roma #tomato. Made famous in Italy for the robust flavored margherita sauce it makes. 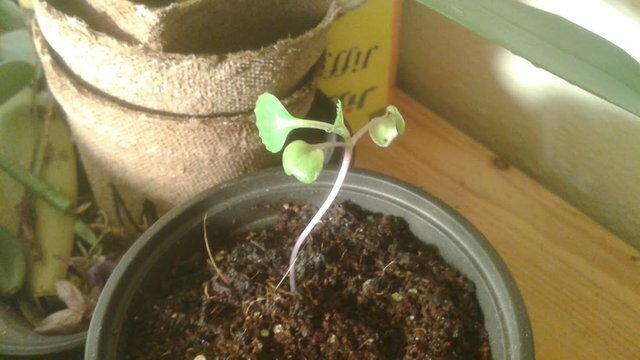 This started as a seed inside the seed tray, sown on January 12. 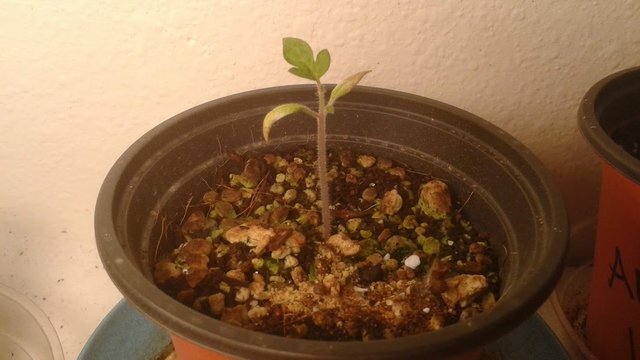 It sprouted quickly on January 16, and was soon transplanted into this pot. Now it is 31 days old. Finally, I end with this smallest runt. This Anaheim #pepper had been growing so slowly, I think that is why I started growing the other two that I pictured earlier. Looks like I forgot to list the date on this pot. My guess it is was direct sown into this pot around the middle of January, making it about 27 days old. Maybe I can find out the exact age by reading through my earlier #gardening posts from this year. Here is the full indoor garden shelf. Time to put the plastic domes and cups back in place. I like rotate the plant placements, and change up which plants get the extra humidity domes once in a while. Today I added some fresh bone-meal and also a 4-3-6 NPK Acidic organic fertilizer amendment. I don't do soil tests or strict measurements. Mainly I just look at the health of the plants, the moisture of the soil, and learn how much they benefit or don't. Maybe I'll become more scientific about it one day, but I'm happy with my way for now. Organic fertilizers are usually safer, as you don't have to worry about burning the roots, like you can easily do with chemical fertilizers. I do have to be careful that I do not alter the pH levels of the soil too much, otherwise I might end up starting a mold-farm instead of a plant garden. If you enjoy posts like these, let me know in the comments. In the background, you might also see an #orchid I am fussing with, and also a #goji berry plant I am trying to develop into a future fruiting shrub and bonsai tree. I am considering featuring those in upcoming articles exclusively here for my friends on the steem blockchain. Also, it's time for me to update my historical steem statistics. Sorry for the long post. This is mainly for my own record-keeping, and this part is long over-due. Wow that's a beauty. Poor tree though. Interesting. I've never seen young barely shoots growing before. They start indoors? Funniest thing I found out in my garden today... we've been having winter storm warnings and snow advisories all this past week. Strangely, I decided to plant carrot seeds a week after Christmas and the New Year, when it was close to freezing out. After all the cold and rain, I now have lots of healthy looking carrot sprouts growing outside in the garden. I tried yanking on a few, because I thought it was grass, but it's carrots, and they already feel firmly attached to the soil. Crossing my fingers that they continue to toughen up this winter before the slugs come out of dormancy. We have not tried carrots recently, but my wife has had good success with radishes and beets this winter. I upvoted your contribution because to my mind your post is at least 4 SBD worth and should receive 310 votes. It's now up to the lovely Steemit community to make this come true. Spring is near now and you can transfer them in the ground after all the snow melts and before they bear fruits and matured their leaves like the cabbage.